Previous part of the series – choosing image format. Last time I covered image formats theory and this part is going to be about making actual screenshots. I want to repeat that it isn’t as easy as pressing PrintScreen (at least if you are after quality and making good impression). It is not last part (editing and some extra stuff ahead) but obviously important one. extracting frames from video (if you ever tried to screenshot them – you know how shy videos are). For making screenshots you need software. Preferably good one. Luckily screenshots were around for such a long time that category is stuffed with decent apps. Some are capable of so much more they start charge money for it. Start with freeware and decide if you actually need video recording or whatever else enough to pay for it. My first choice tool is FastStone Capture. It went shareware but there is old freeware version available and it’s very good. Alternatively you can get free FastStone Image Viewer that has Capture built-in (File > Screen Capture). Bit weird to charge for what you are giving away for free in another product, but its their business. :) I am going to stick to old version in this post. My second choice is MWSnap. It does most of what FSCapture does and some what it doesn’t (fixed size region shots) but has less polished interface and I find it harder to use. Program appears as small floating toolbar. It’s actually one of two interfaces. Second is editor window you get after making a shot (with default options). Most buttons launch different shot modes. Just try them all to get acquainted. If you place cursor on button and wait a bit you get tooltip with description and current hotkey. Last button gives you access to settings and two extra tools (color picker and screen magnifier). Button with palette allows you to chose what to do with screenshot. Default is opening it in internal editor. I mostly use copy to clipboard so I can paste it to another editor (editing is going to be covered in next part of series). You can also enable mouse cursor capturing here. By default most screenshot tools are not capturing mouse cursor. Settings allow you to change all hotkeys and tweak some extra things. My advice is to concentrate on mastering rectangular region capture. Capturing fullscreen or window is pretty easy but capturing regions may take some practice to get exactly what you want with pixel precision (built-in screen magnifier helps a lot). I like to include software icons in my posts. They are uniform in size, look nice and people recognize them instantly if it is popular app. On the downside it’s hard to get screenshot of icon, resize it to specific size and keep good look. Luckily if you have application itself you can rip icon out of it. IcoFX is nice icon editor that is pretty good for this task. Locate main application executable. Look in the shortcut properties or simply in app directory. For IcoFX itself it’s "IcoFX.exe" for example. Drag and drop executable into IcoFX window. Don’t worry – it’s not going to do any harm to application. 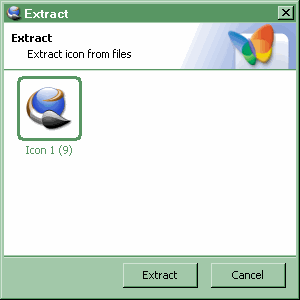 You get window with all icons in executable (can be one, can be many). Choose icon you need and you’ll open it in editor. If you want to save transparency right-click needed image size and choose "Export image". Export to format that actually supports transparency (PNG or GIF). If you want to get rid of transparency export to other format or select all image (Ctrl+A) and copy it (Ctrl+V). Now you can just paste it to normal image editor of your choice. Freeware with portable version available. If you had ever tried to make a screenshot of video file playing – most probably you got screenshot with black (green, purple) rectangle instead of that nice frame. Because of performance issues video doesn’t exist "in screen". It’s kinda in separate layer. Some players like Media Player Classic allow to tweak and change that mode but it’s relatively complex. 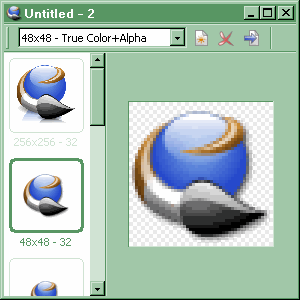 As with icons – using special tool is better. 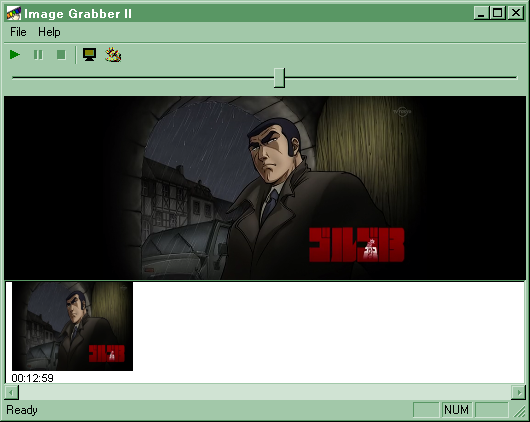 Image Grabber II is simple utility for extracting images from videos. It has no home site (at least I hadn’t been able to find one) so there is not much details on specifics and supported formats. It seems to handle most of usual stuff, quick time and VideoCD. It looks like simple video player with ability to save specific frames, extract numerous frames and make images with thumbnails. Simply find frame you need, press rightmost button – it appears under video. Repeat if needed and use File > Save multiply to save all of them. By the way Image Grabber displays video in screenshotable way so you can just use another tool like FSCapture to make a shot. Next part of screenshoting series is going to cover editing and compressing images. I’ve been using FastStone Capture for years (the free version) and still haven’t been able to find a replacement for it. Great application. EasyCapture looks very promising, with a tabbed interface and all, but the image quality is a turn-off, makes me go back to FSCapture. I’m still looking for its new release. Yeah, FCapture feels reaaaaly polished. Nothing unneded, great usability. Hadn’t tried EasyCapture. I’ll check it out. screen capture, but have been happy with Greenshot. Have been using VLC for both video re-play and frame capture. I had more or less moved on to PicPick. It still lacks some features of FSCapture but brings good stuff to the table. I think I have greenshot bookmarked to research, hadn;t gotten to it yet. …90% of what I work with ! Guess I’ll stick with using the screen-grab faculty in VLC. Worked fine for me for AVIs and MKVs but I don’t remember about codecs used. Hadn’t used it lately, had no need. Maybe good additions to this post are the checklist of criteria for selecting a screen capture tool at http://www.indoition.com/screen-capture-tool-choosing.htm, as well as the list of screen capture tools on the same web site. Will check it out, thanks for suggestion.